Captain (RCN) Zimmerman joined the Canadian Forces through HMCS Star, Hamilton, Ont. in 1972. After completing the Regular Force Bridge Watchkeeping Certificate, he held Marine Surface Officer positions on various small ships including HMCS Oriole. Responding to a call to ministry in the Canadian Forces in 1980, Chaplain Zimmerman has provided chaplain services to HMC Ships at sea (CFB Halifax), Royal Roads Military College, CFB Ottawa (Rockcliffe Chapel), and CFB Shearwater. After a year of postgraduate studies, he was posted to National Defence Medical Centre, and then to “2 Health Services Operational Training Unit”. Promoted to Commander he served as the Navy Command Chaplain, the Commandant Canadian Forces Chaplain School and Center, and in various senior staff officer positions at the Chaplain General’s Office. Retiring from Regular Force in 2009 he accepted a new reserve LCdr position focusing on Reserve and Cadet Chaplaincy. 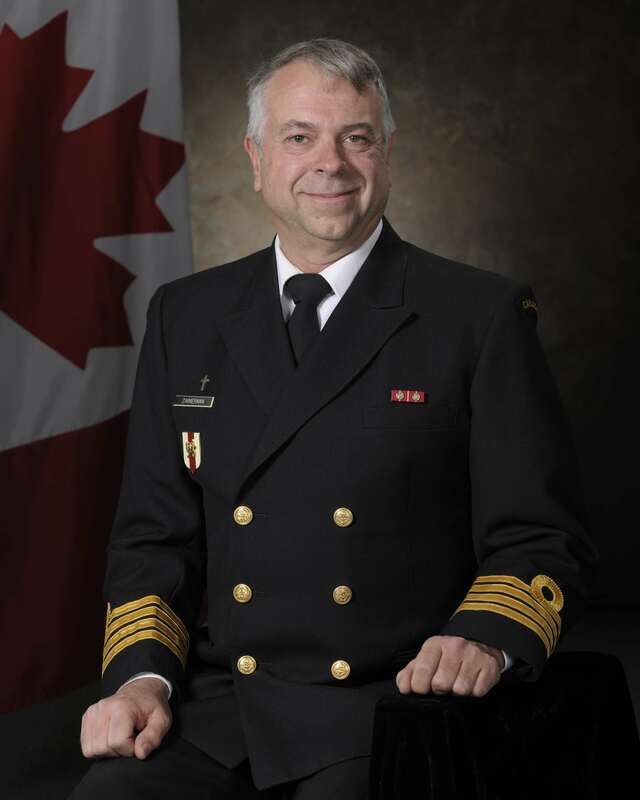 As a result of administrative errors recognized by the Canadian Federal Court of Appeal February 2011 and by the CDS June 2011, Commander Zimmerman was promoted to Captain RCN with seniority of 1 December 2003. Captain (RCN) Zimmerman completed a Masters Degree in Arts, University of St. Paul in 1997 concentrating on Individual Pastoral Counselling. A serious student, he is the author/co-author of several research publications and presentations to internationally recognized academic organizations such as the American Psychological Association, International Society of Traumatic Stress Studies, Military Medicine, and the American Journal of Pastoral Studies. Chaplain Zimmerman was a major contributor to a number of landmark projects. These include the Care for the Caregiver program, the development of the national Operational Trauma Stress and Support Centers (OTSSC), and the provision of chaplain services to the Third Location Decompression program. A strong supporter of the Presbyterian Church, the Rev. Zimmerman has been Moderator of two Presbyteries, has chaired a General Assembly Commission, and various committees of the Ottawa Presbytery. He has been appointed Interim Moderator of three large downtown churches Victoria and Ottawa. George Zimmerman, after 38 years of military service took his release on 24 May 2010. He accepted a “call” to St. David and St. Martin Presbyterian Church, Ottawa, where he continues his ministry.